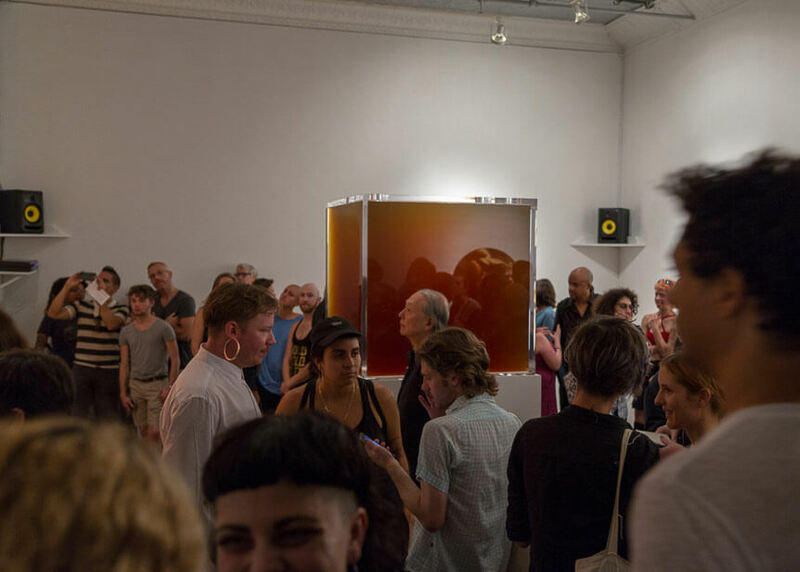 PISSED is a minimalist glass cube containing 200 gallons of urine. This tank of glowing urine manifests what may seem abstract in discussion: the physical burden placed on an individual body when bathroom access is restricted by discriminatory policy. 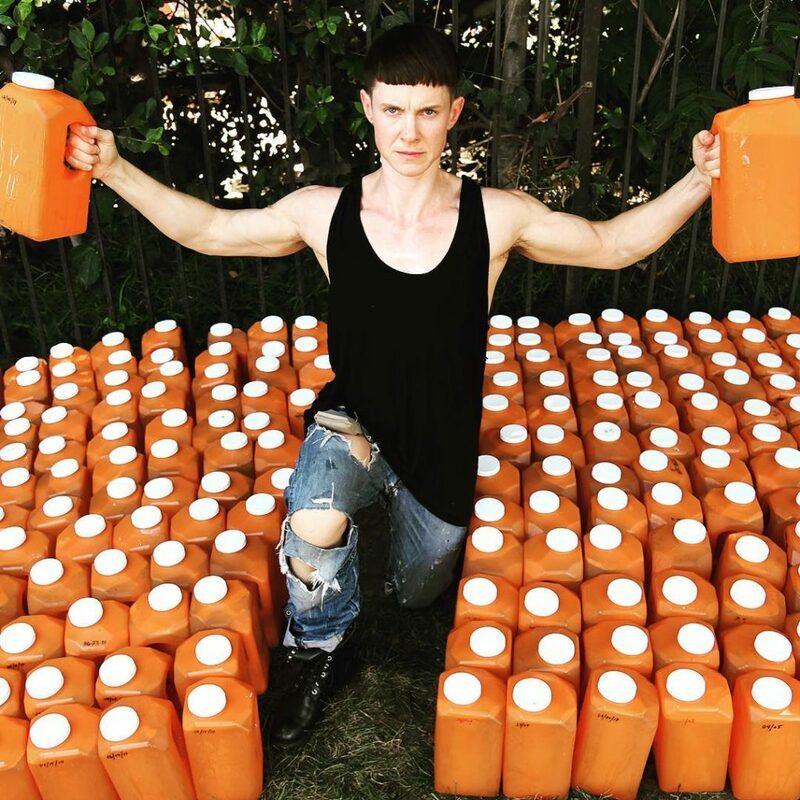 PISSED is a collection of all the liquid excreted by the artist in the 200 days following the Trump administration’s 2017 rollback of an Obama-era executive order allowing transgender students to use the bathroom matching their chosen gender identities. Fountain marked the final two hours of a 4,800 hour performance. At the close of 200 days of collecting every drop of their urine, Cassils invited the audience to witness the final acts that would complete the durational sculpture PISSED. 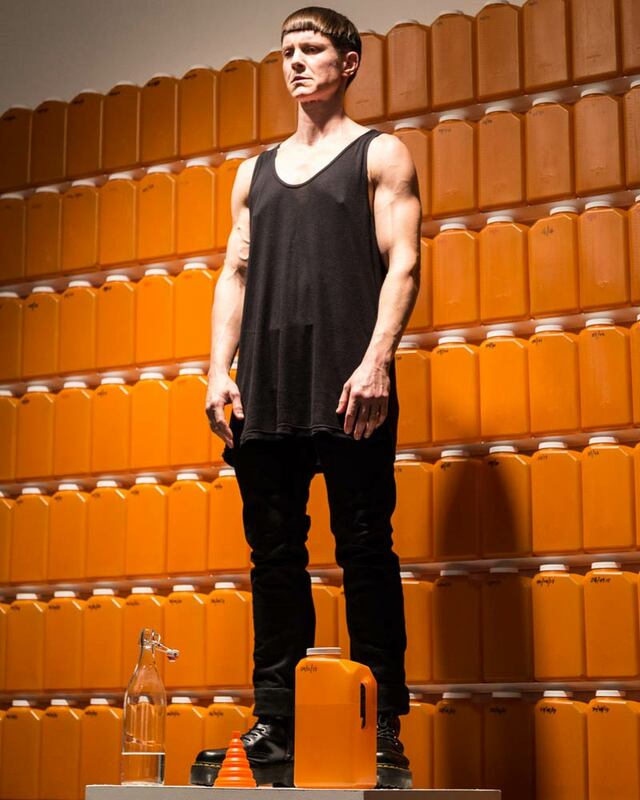 Standing on a platform above the audience in front of a grid of 255 orange medical bottles marked with the date of urine capture, the artist shared the deeply human acts of standing, drinking, and urinating. PISSED’s audio track features the oral arguments from the case of Gavin Grimm, the transgender male teen who became the face of transgender rights in his fight to use the boys bathroom in a school in Virginia. In the fall of 2017, Grimm’s case was accepted, and shortly thereafter rejected, by the Supreme Court— thus staying a decision by the Fourth Circuit Court of Appeals which prevents Gavin from using the boys bathroom to this day 4 Over the two hours of the audio composition, the audience hears the ignorance or bible-quoting adults juxtaposed with the crisp, simple clarity of Gavin’s plea to pee against a sonic landscape of water flowing and flushing. This tank of glowing urine manifests what may seem abstract in discussion: the physical burden placed on an individual body when bathroom access is restricted by discriminatory policy.